As much as I would love to cook for my blog full-time, I have to go to work each day, often work long hours, and many times eat lunch at my desk. I used to be able to skip breakfast but I just can’t do that anymore so I do my best to eat something healthy. I have to muster up every ounce of self-control not to run to the Dunkin’ Donuts for egg and cheese on a fattening bagel. I rarely bring in cereal because I don’t want to have to worry about running out to buy milk and I think it’s a pain to bring in egg whites to cook in the microwave. Despite the fact that my office building provides a two-story cafeteria for employees with stunning views of Philadelphia, I rarely go up there because I don’t trust myself to get something healthy with all of the other buttery, cheesy options available (I could eat the walnut-raisin cream cheese by the spoonful!). 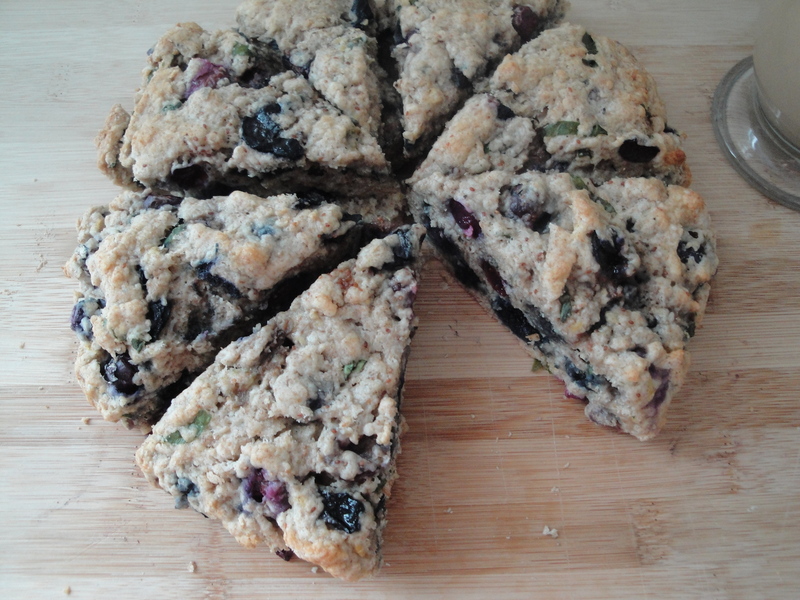 Generally, I grab a packet of oatmeal from home but every once in a while, I love to make muffins or scones to store in the freezer which are easy to grab as I’m running out the door. Blueberries are ridiculously delicious right now so I keep buying packages of them each time I’m at the store or produce market. 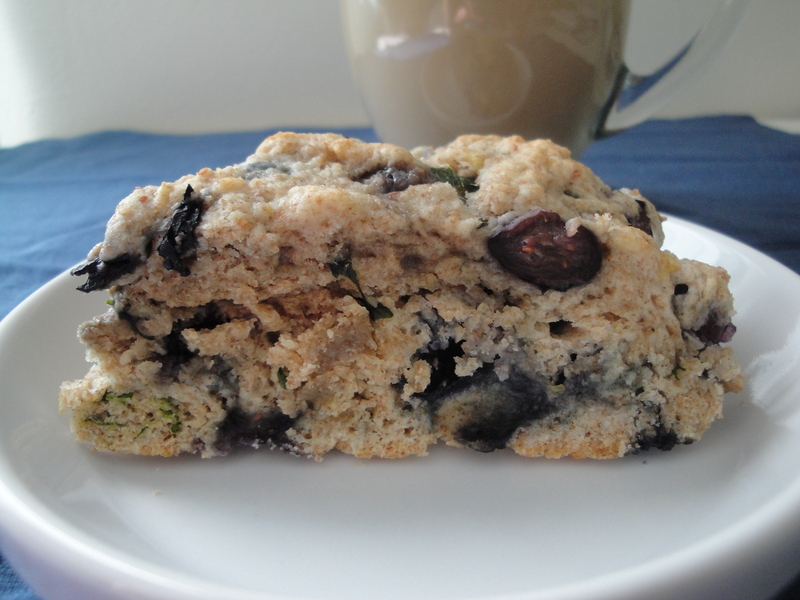 Wanting something a little more interesting than plain old blueberry scones, I decided to use up the last of some of my basil and make Blueberry-Basil Scones. It may sound like an odd combination but they are both fresh, vibrant flavors that just so happen to complement one another. 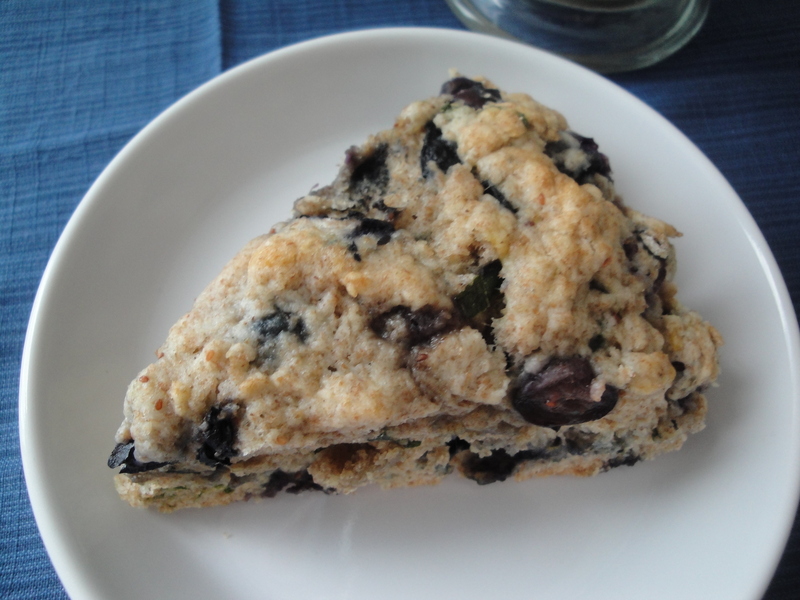 These scones also have a bit of lemon zest as well, adding to the brightness of these scones. Eat these toasted with a little bit of butter or jam or just eat them plain and enjoy how the blueberries pop so perfectly in every bite. Preheat oven to 400°F. Line a baking sheet with parchment paper or a silicone baking mat, and set aside. 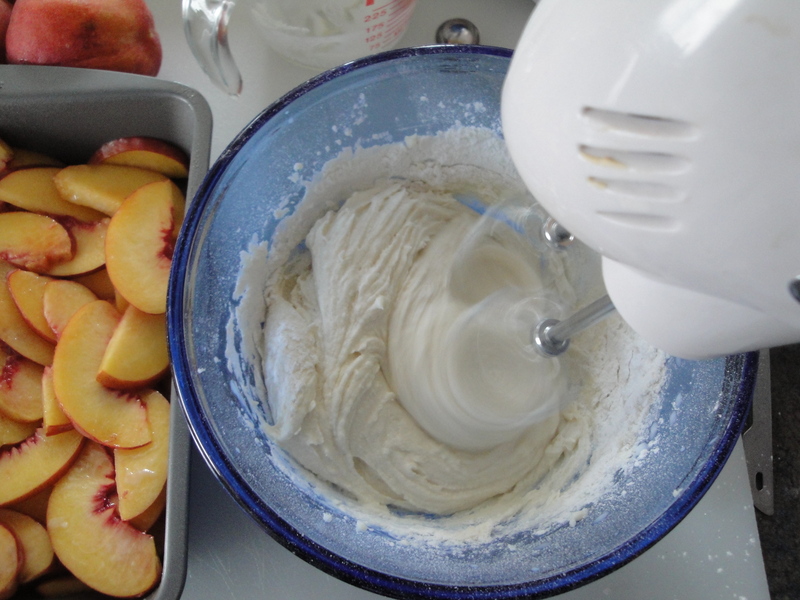 In a large bowl, combines flours, sugar, baking powder, and salt. 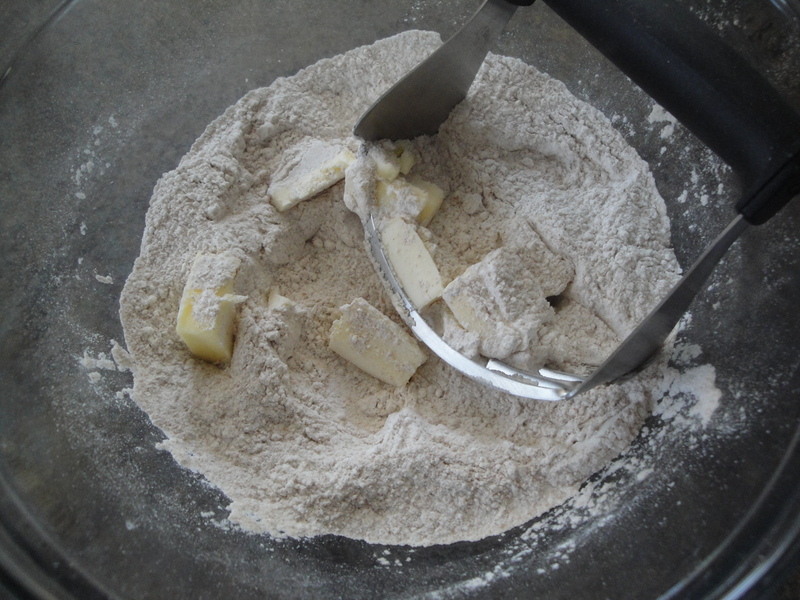 Using a pastry cutter or two knives, cut butter into the flour mixture until incorporated. 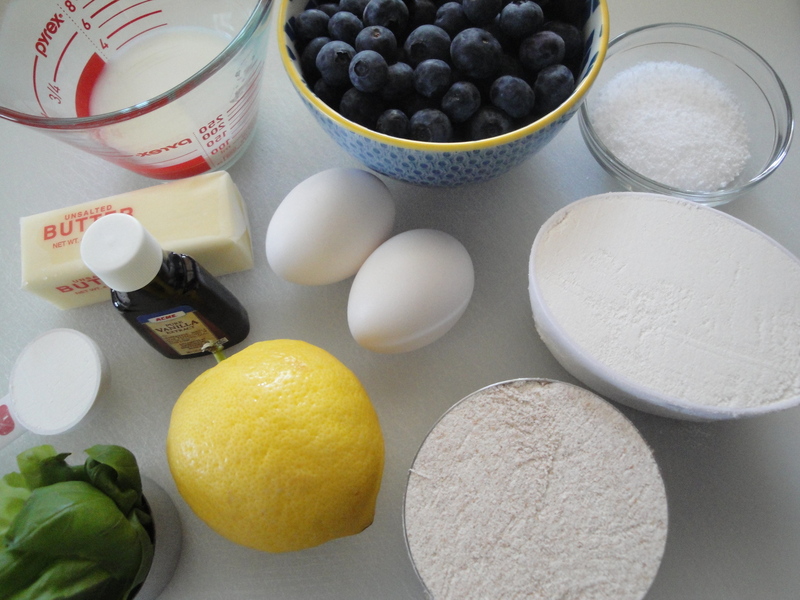 Stir in blueberries, basil and lemon zest. 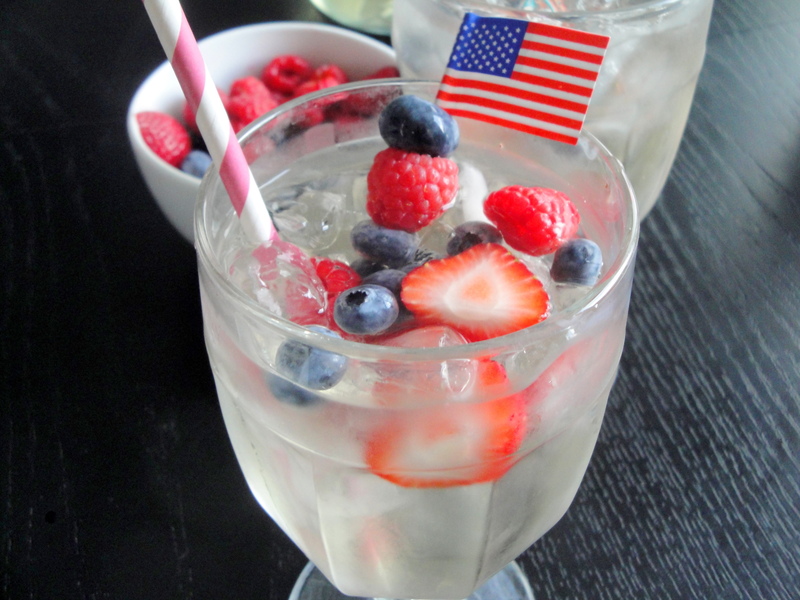 In a small bowl or measuring cup, whisk together milk, vanilla and eggs. Make a well in the center of the dry ingredients and pour in the milk mixture. 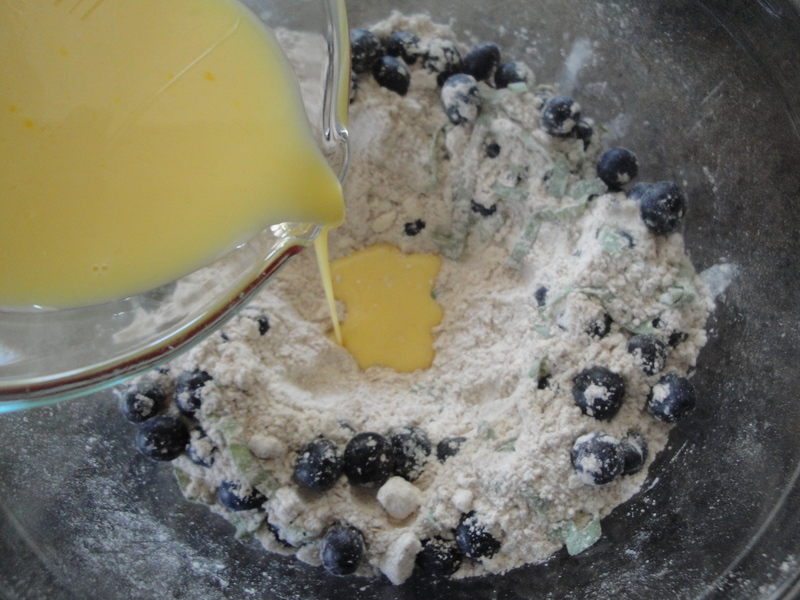 Carefully combine the mixture with a fork just until dough comes together. Turn dough out onto a lightly floured surface, and carefully knead a few times (do not overknead). 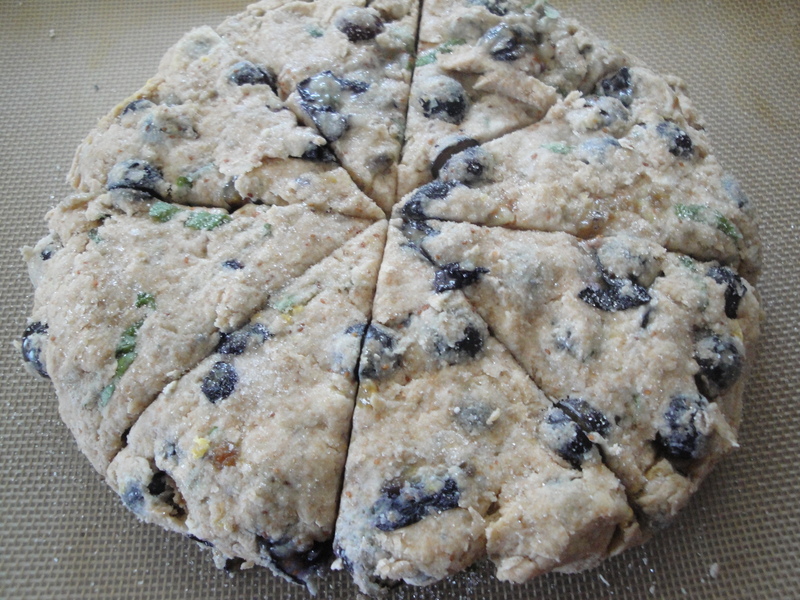 Shape dough into an 8-inch circle and place on the baking sheet. Cut dough into 8 wedges, cutting into, but not through, the dough. Bake until golden brown, 20 to 22 minutes. Transfer scones to wire racks to cool. Optional: Brush 2 teaspoons of additional milk over surface of dough and sprinkle with 2 teaspoons of additional sugar before baking. 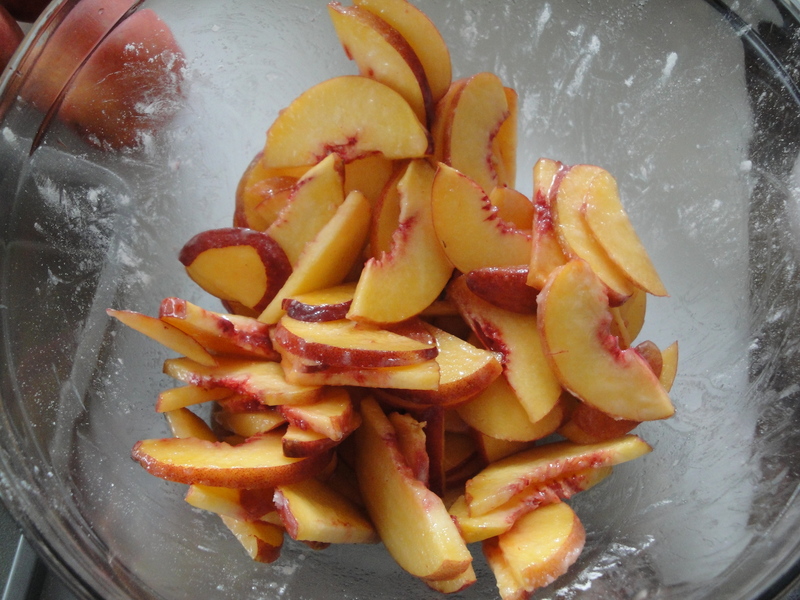 In a large bowl, combines flours, sugar, baking powder, and salt. 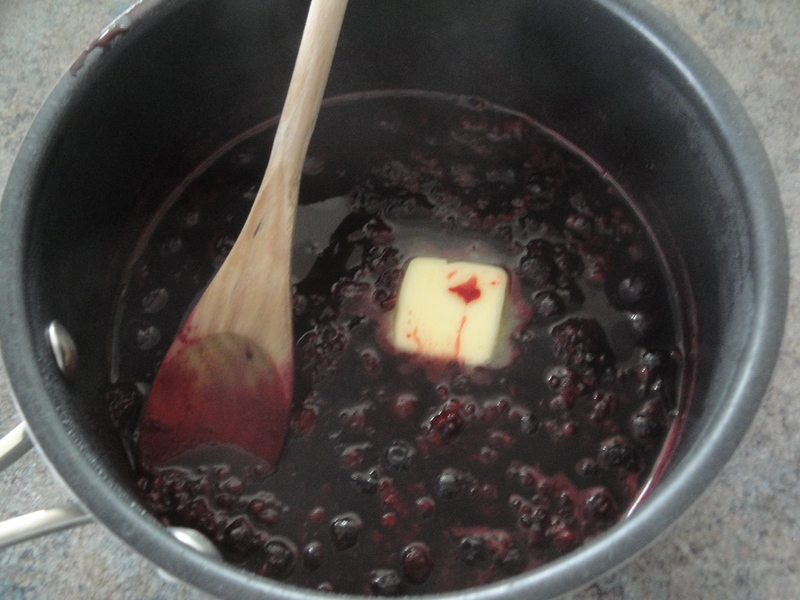 Using a pastry cutter or two knives, cut butter into the flour mixture until incorporated. 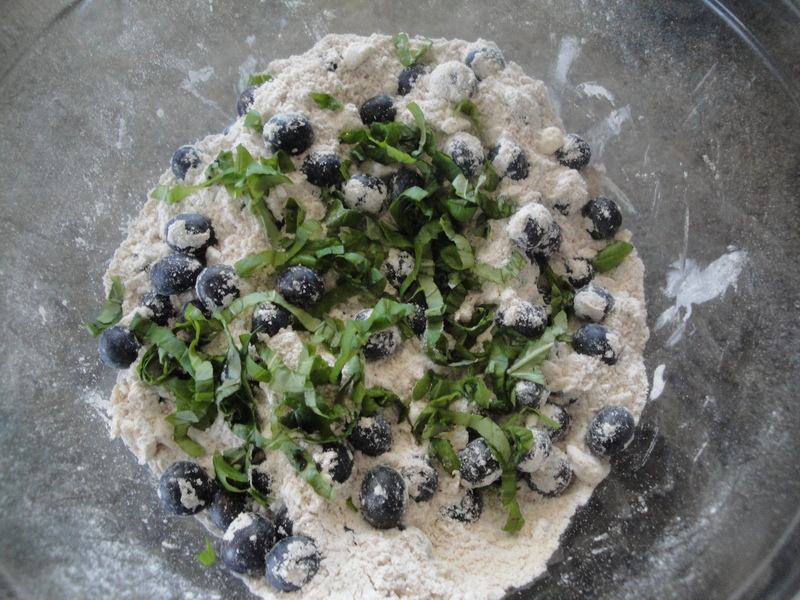 Stir in blueberries, basil and lemon zest. 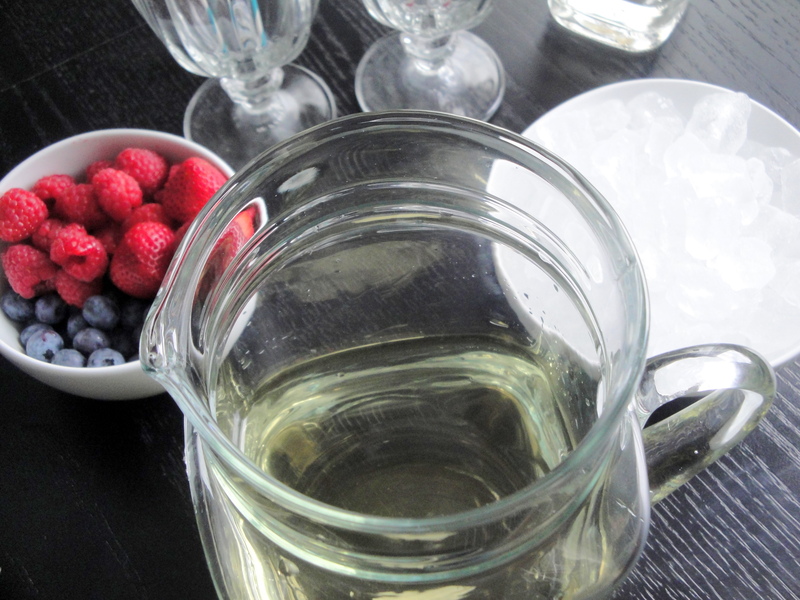 In a small bowl or measuring cup, whisk together milk, vanilla and eggs. 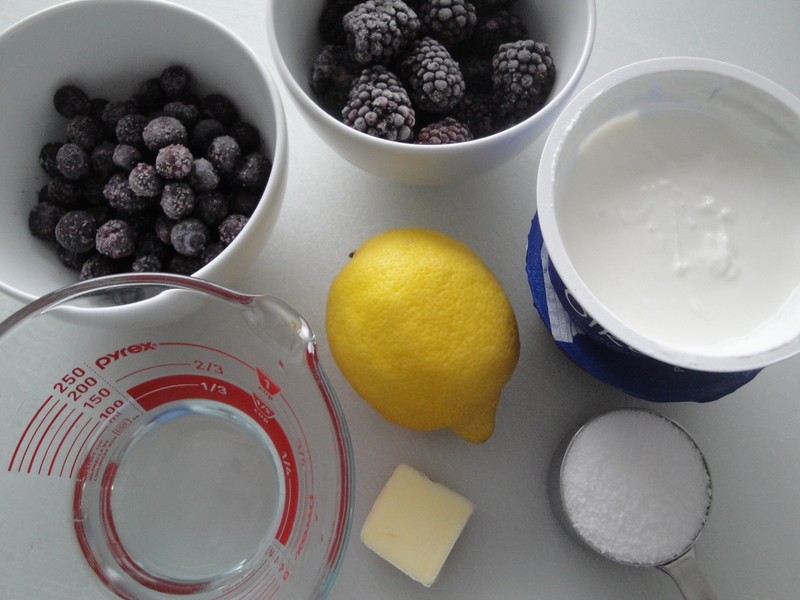 Make a well in the center of the dry ingredients and pour in the milk mixture. Carefully combine the mixture with a fork just until dough comes together. 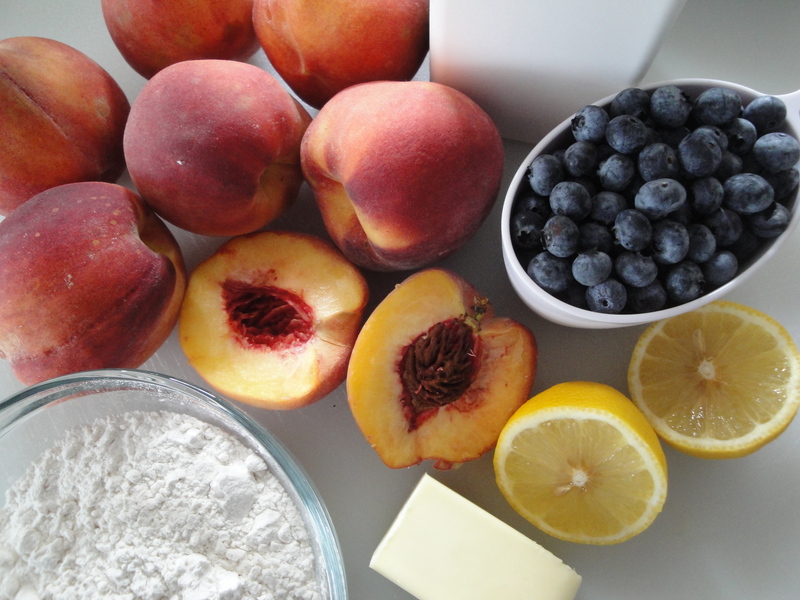 Turn dough out onto a lightly floured surface, and carefully knead a few times (do not overknead). 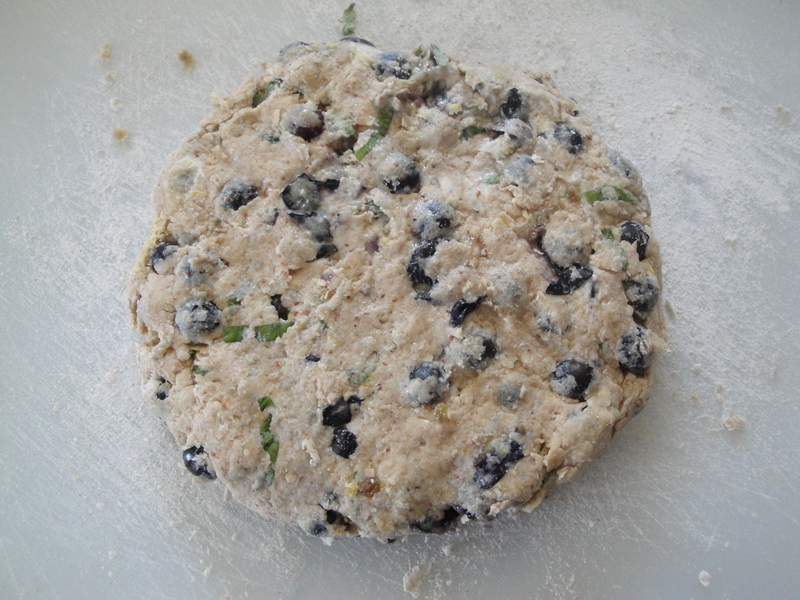 Shape dough into an 8-inch circle and place on the baking sheet. Cut dough into 8 wedges, cutting into, but not through, the dough. Bake until golden brown, 20 to 22 minutes. Transfer scones to wire racks to cool. 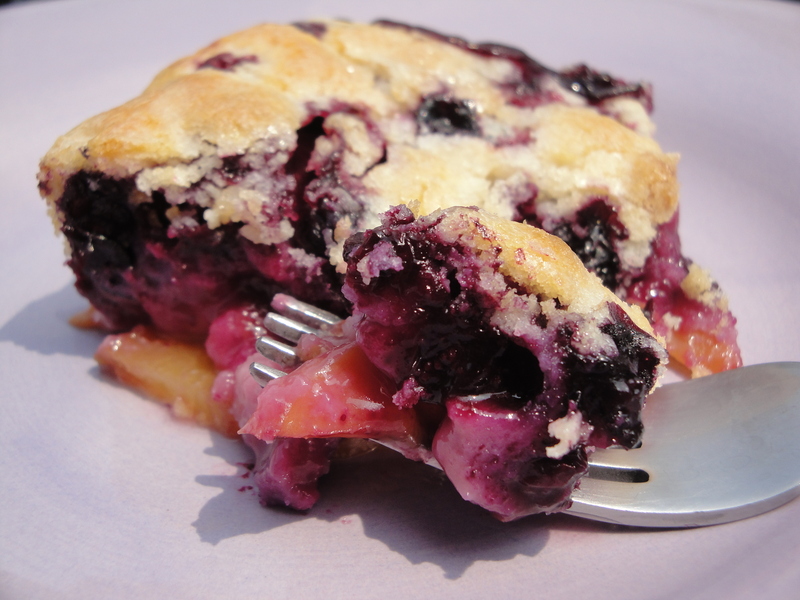 Are you one of those people who doesn’t like a really sweet dessert? Or are you someone like me who loves sweet dessert but doesn’t want to feel guilty after eating it? And are you also someone like me who keeps frozen fruit on hand for smoothies? If so, Greek Yogurt with Warm Berry Sauce is just for you. 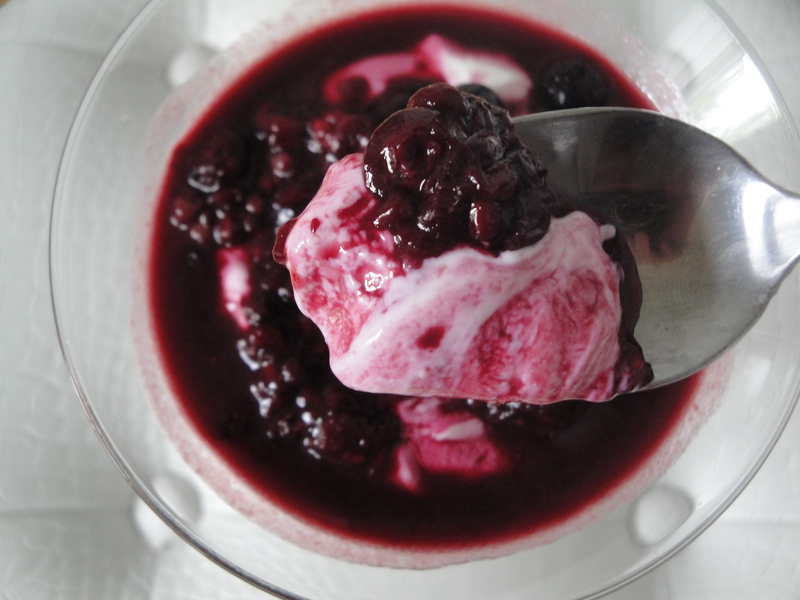 Frozen blueberries and blackberries are simmered with sugar, water, and lemon juice to create a rich and vibrant berry sauce that is spooned over plain Greek yogurt for a slightly tart yet slighty sweet and overall delicious dessert treat. 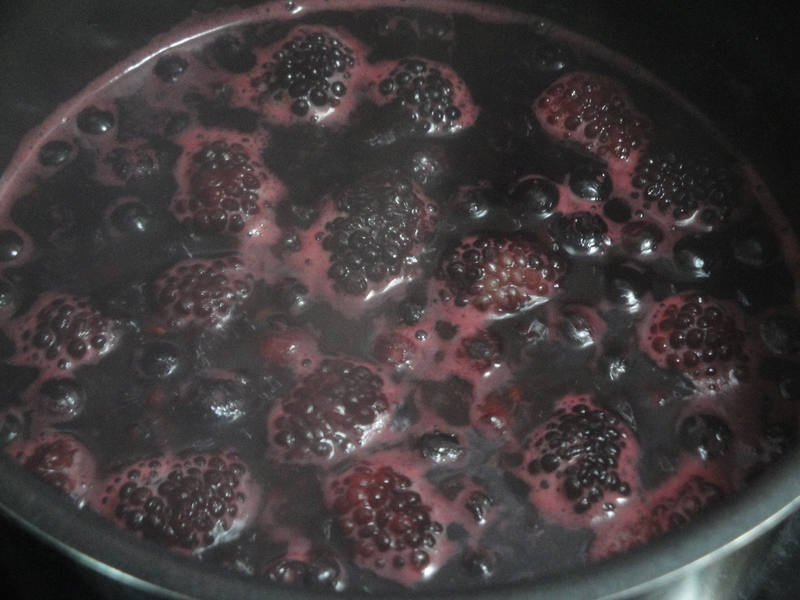 The smell of cooking berries permeates the kitchen so beautifully that you wonder why you ever bought a berry-scented candle before. 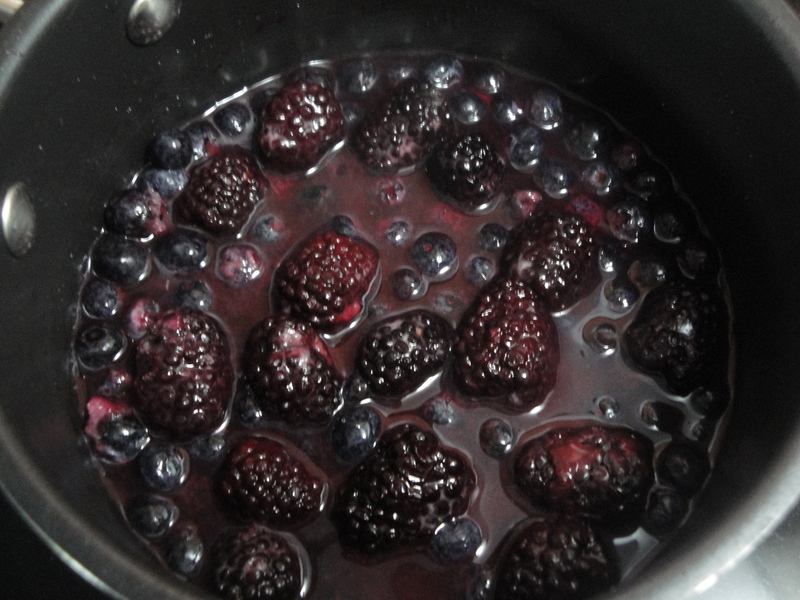 This berry sauce is beautiful and would be delicious over ice cream, pancakes, waffles, or anything else you can think of. 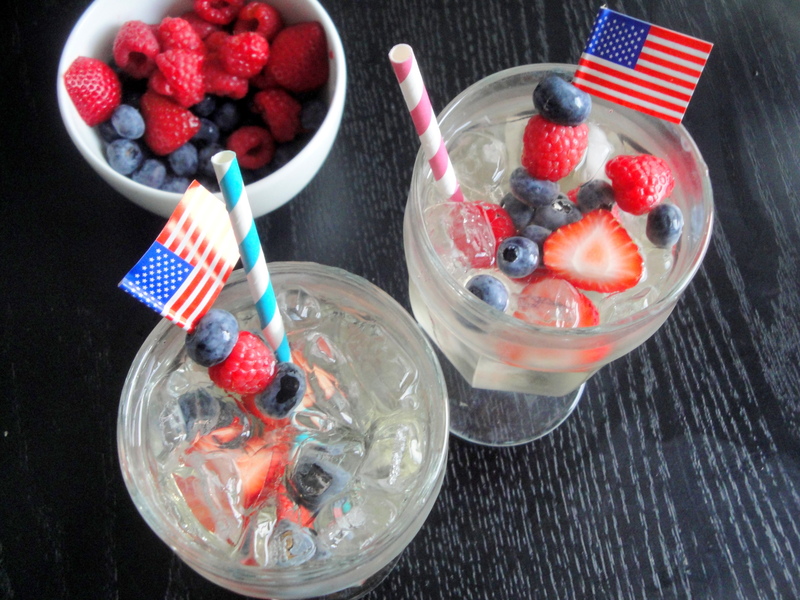 Use any mixture of berries you like as I think strawberries or raspberries would be delicious too. 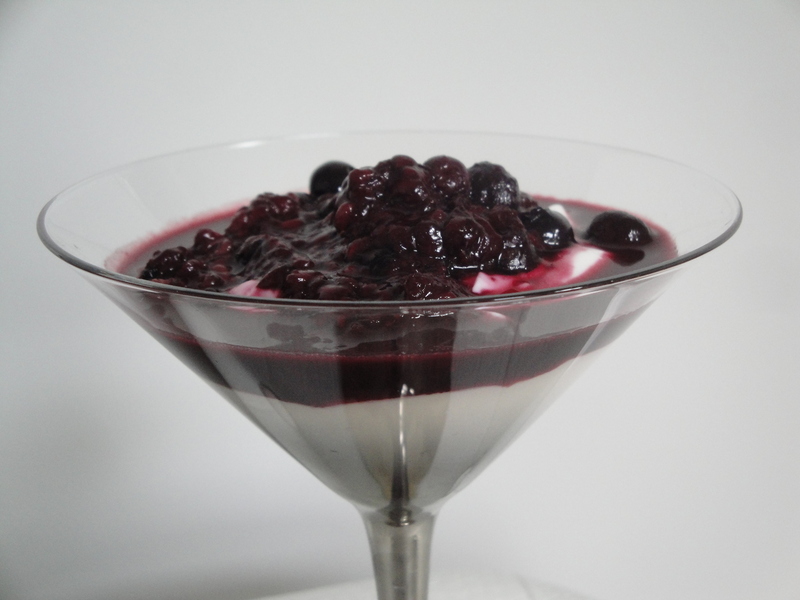 Spoon 1/2 cup yogurt into each of 4 bowls and top each serving with about 1/4 cup sauce.